The good news is, that if one of the couple is a resident then you can be married as a resident, even if the other person is a visitor, as long as you have time for the Banns to be published, which is 7 clear days. The other good news is that it’s much less expensive to be married by Banns! In order to be married by Banns, you must have an interview with your wedding celebrant, or someone equally versed in the Marriage Law and your documents must be scrutinized and the originals copied for our files. You must show your passport, and any divorce decrees or former spouses’ death certificate. The most important part of this interview is that your interviewer must determine your immigration status, and be convinced that you are not attempting a “marriage of convenience”, which is illegal in the Cayman Islands and elsewhere. At this initial interview you must complete and sign a document called the “Notice of Marriage”. We copy the Notice, and use it to complete the details required on your Banns, and eventually your Marriage Certificate. The original Notice must be countersigned by two persons over 18 years who have known you for at least two years and can attest to the authenticity of the details you have provided. The Notice is then returned to the Simply Weddings office prior to the wedding taking place. Should you have any questions about anything to do with your marriage you should call us at (345) 9499933. You can also drop in and see us at 306 North Church Street in the ERA Kirkconnell Realty Building (next to Kirk’s Supermarket). 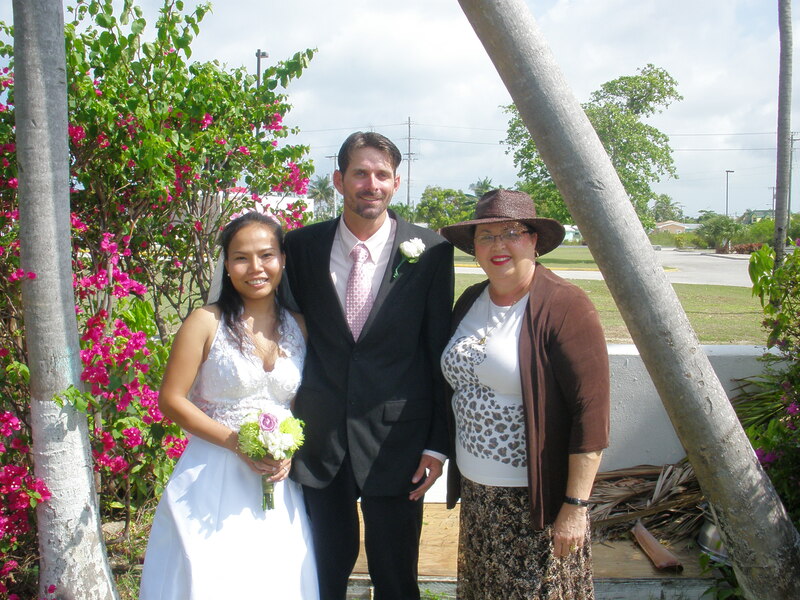 You can be married at the Simply Weddings office during office hours, which are Mon – Fri, 9am until 3pm, or you can be married at the location of your choice, including most public beaches. There is a small fee charged for weddings outside George Town and West Bay, and there is an additional charge for weddings on Sunday and Public Holidays. Remember that Saturday is the most popular day for resident weddings, so book early and get your paperwork completed to avoid disappointment. Dart's Park, Camana Bay, Pedro St James, and the Queen Elizabeth II Botanic Park. You can also be married at any of the hotels, our residence. I will officiate at a church wedding if invited by the pastor, but this is normally a shared service where I do the legal part of the ceremony, and the minister does the religious part.